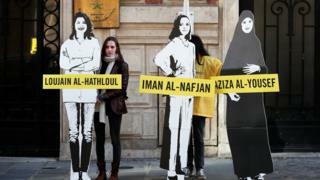 A number of women’s rights activists have gone on trial in Saudi Arabia in a case that has raised questions about the kingdom’s human rights record. Those due to appear include Loujain al-Hathloul, a prominent figure in the campaign to win Saudi women the right to drive. She was detained last May. Charges they face are said to include supporting “hostile elements” and could carry long prison sentences. Demands for the women’s release have come from around the world. Last week more than 30 countries at the UN Human Rights Council criticised Saudi Arabia for detaining the women. Scrutiny of human rights in the kingdom has intensified since the murder of journalist Jamal Khashoggi at the Saudi consulate in Istanbul last October. As many as 10 women were expected to appear at the criminal court in Riyadh on Wednesday. As well as Ms Hathloul they include fellow rights activists Aziza al-Yousef, Eman al-Nafjan and Hatoon al-Fassi. Journalists and diplomats are not allowed to attend the hearing. Saudi Arabia has an enduring problem with human rights and, sadly, the case of the detained women activists is only the tip of the iceberg. In practices that have been going on for decades, citizens detained by the authorities can be held incommunicado, denied access to lawyers, kept in the dark about the charges against them and, most worryingly, abused during interrogation and coerced into signing confessions. The Saudi government’s reaction is almost invariably the same – it denies all allegations of torture, it fails to punish those who carry it out, and it rejects all international criticism as “unjustified interference in its internal affairs”. Saudi Arabia does have, more broadly, some legitimate security concerns. But putting on trial women who campaigned for the right to drive or win equal rights to men is doing it no favours in world opinion. The detentions of the women began last May, shortly before the driving ban was lifted. The public prosecutor’s office has not specified the charges against the accused, but said they were suspected of undertaking “co-ordinated and organised activities… that aim to undermine the kingdom’s security, stability and national unity”. On Tuesday, Ms Hathloul’s brother said the trial had been switched to the criminal court from the Specialized Criminal Court, which was set up to try terrorism cases. The reason for the decision was not clear. The Gulf Centre for Human Rights said on Tuesday that it feared the women might not get a fair trial and that it was “deeply concerned” about their wellbeing. In November, human rights groups reported that at least four of the women were alleging that interrogators had tortured them, including with electric shocks and whippings, and had sexually harassed and assaulted them. The Saudi deputy public prosecutor has said the allegations are false. Saudi officials have accused critics of interfering in the Gulf kingdom’s domestic affairs “under the guise of defending human rights”. Last August, Saudi Arabia froze trade ties with Canada and expelled its ambassador in response to calls to release the detained activists. At the time, the Office of the UN High Commissioner for Human Rights said at least 15 human rights defenders and women’s rights activists critical of the Saudi government had been arrested or detained arbitrarily since 15 May. Ms Badawi, who was given the US International Women of Courage Award in 2012, is known for challenging Saudi Arabia’s male guardianship system.